Congratulations to Alchemy at AMS and the Dallas Zoo for winning a 2016 Dallas Addy Award for the Giants of the Jurassic DART bus wrap. The Giants of the Jurassic exhibit at the Dallas Zoo showcased more than 20 animatronic dinosaurs last summer. 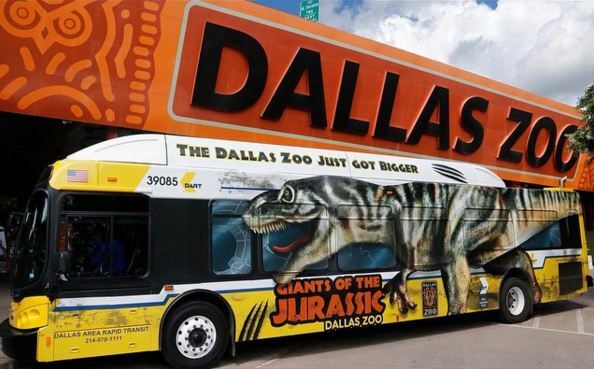 The award-winning advertising campaign included DART bus wraps that brought the Tyrannosaurus rex to the streets of North Texas. Did you know DART’s Red Line has direct service to the front door of the Dallas Zoo? Learn more at DART.org. Alchemy at AMS is a strategic marketing and creative design agency that also represents DART. The American Advertising Awards is the advertising industry’s largest and most representative competition, attracting over 40,000 entries every year in local AAF Club competitions.